The Grand Old Lady of Meredith nightlife. 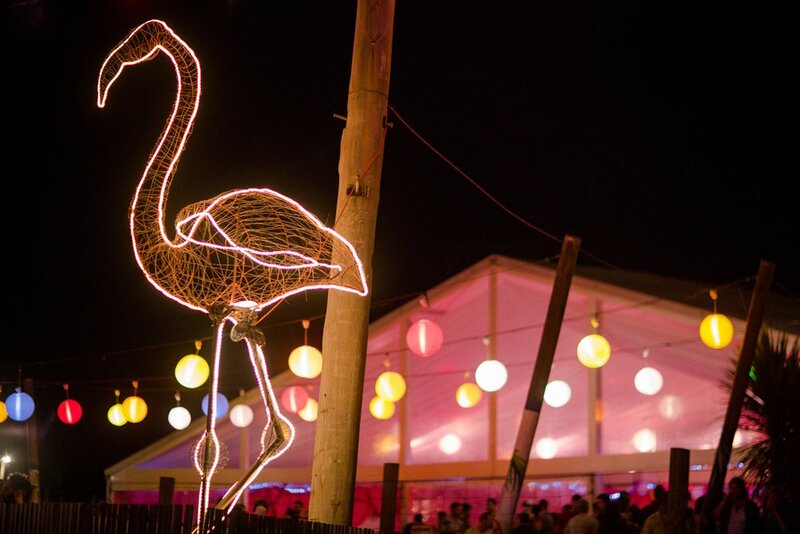 The Pink Flamingo is a perennial favourite at Meredith; over the years she has undergone countless facelifts, renovations and undercover raids, but her popularity endures. Never once, I might add, has she had a complaint from neighbours, which says a lot about the character of the good people of Hong Kong Island and Mulwaverley, whose homes adjoin the landmark latenite hub. Obviously any new people moving into the area understand it is a long-standing and culturally vital entertainment precinct, so they appreciate that the incumbent culture takes priority over their individual desires. It’s obvious, right? The Flamingo has a chequered history, to say the least, with the bar changing hands almost every other year since it opened in 1964. It started as a swank nitespot for the state’s power elite but soon developed a seedy reputation when a series of mishaps and incidents put it in the social pages for all the wrong reasons throughout the late 70s and early 80s. The nadir was undoubtedly the infamous fake kidnapping of door hardware heiress Keira “Clicky” Lockworth in 1982. The Pink Flamingo is essentially a cocktail bar. It sells three cocktails – the Pink Flamingo (vodka, pink grapefruit, some other stuff), the Espresso Martini (nitrogen-charged, not stirred) and the Bloody Meredith (popular on Sunday – vodka, tomato juice, celery, two eggs, roast chicken, two coffees and some lemon meringue pie). The Pink Flamingo Bar is for over 18s only. 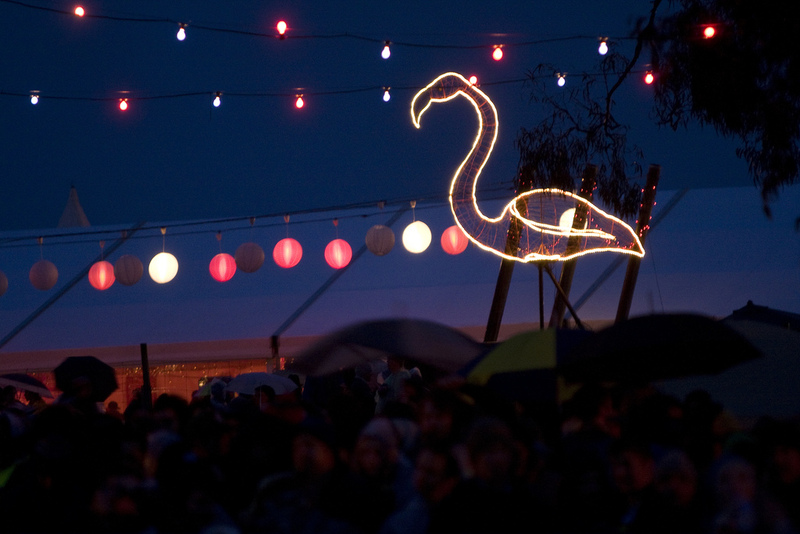 The Pink Flamingo’s location is at the back of the Amphitheatre, just next to the International Food Court, on the fringe of the Top Paddock. 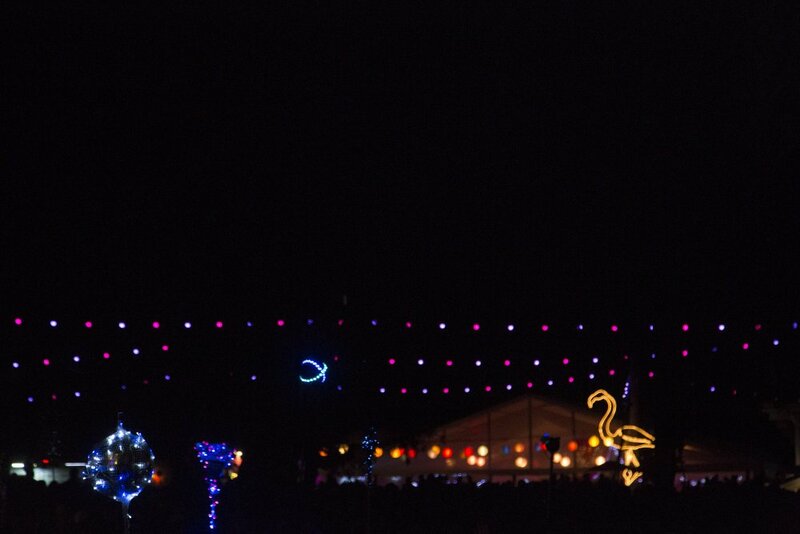 You can see the stage easily from the front garden of the Pink Flamingo. The Flamingo has a distrust of anyone wearing rayon, and bar staff have license to display mild contempt for any signs of social sycophancy. As usual costumes with elaborate headwear or militaria are celebrated, as is anyone arriving via motor launch or punt. 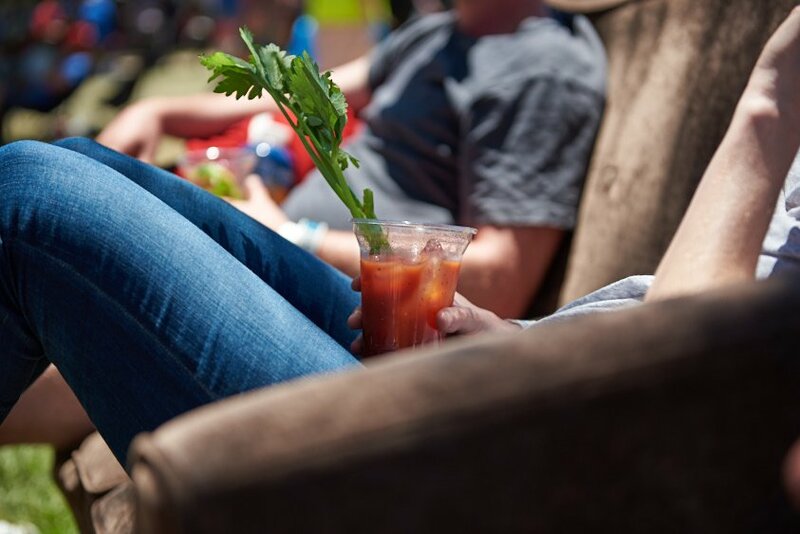 We advocate the responsible consumption of alcohol at all times at Meredith. If you are under 18, you won’t be able to drink alcohol, or enter any licensed areas. Simple as that. After the resounding success of 2015’s Silver Jubilee, colourful local identity Danny Upshaw returned. Reports circulated that he had re-written the constitution of the Flamingo to install himself as President in perpetuity. Minutes for meetings in this period were not made public despite repeated requests. Miffed by the growing success of rival establishment Eric’s, Upshaw submitted plans to council for a copycat venue called Derek’s. Rogue operator Danny Upshaw has been removed from office and banned for life by an emergency meeting of the board. The locks have been changed. A group of young entrepreneurs and ‘makers’ from Queanbeyan have submitted an impressive proposal to re-launch the Flamingo as an aquarium – with a twist. Rather than sharks or stingrays and colourful reef fish from exotic climes, the makers intend to only showcase creatures from local rivers, streams and dams. So as customers relax with a Pink Flamingo in hand and listen to the sounds of the world’s most wonderful musicians letting it all go from The One And Only Stage, they will be surrounded by giant muddy tanks swarming with Short-finned Eels, Eastern Gambusia, Tupong, Pygmy Perch, Spotted Galaxios and the redoubtable Tench. A platypus exhibit will open only at dusk and dawn, and a special yabby show for kids will happen at 11am and 3pm each day. Price of entry includes a Gabby The Yabby showbag. 1998 first opened as The Pink Flamingo Yacht Club Bar, with hosts Commodore Bahamas Lite and Commodore Pink Jazz. 1999 The Pink Flamingo Ski Lodge, with hosts Heidi and Klaus, included their famous Alpine Friendliness TM. 2000 The Pink Flamingo RSL, with bingo and bowls, and a Meredith Gift Honour Board. Run by committee. 2001 The Pink Flamingo Speakeasy and Cinema. Some of the films really messed with some of the patrons’ minds. 2002 The Pink Flamingo Bar. Shady, quiet and comfortable. And pink. 2003 The Pink Flamingo Bar. Provincial quail nursery and Swedish tennis fan face painting station. 2004 The Pink Flamingo Bar and Health-giving Mud Baths. Got a bit messy. 2005 The Pink Flamingo Bar and Grill. Sunny skies, flippin’ burgers. 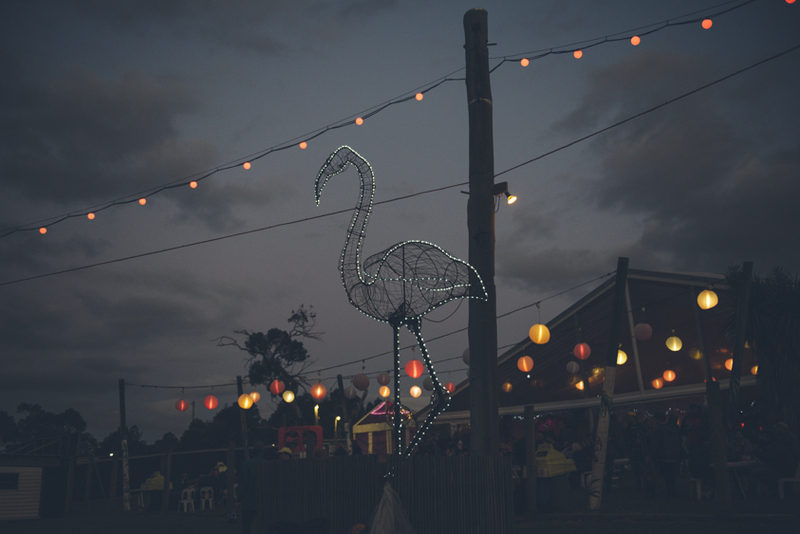 2006 Giant illuminated Flamingo erected at entrance. Old Flamingo decor retired. 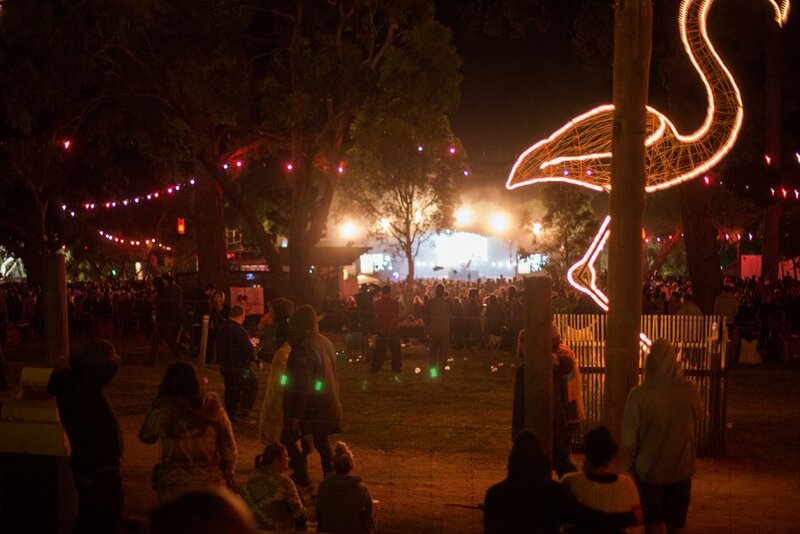 Flamingo Workers’ Collective installed as new owners. A Saturday Night Fever party for the Saturday Night and a one-dayer on the telly Friday Night to bring in the punters. The PubTab re-opened. 2007 Workers’ Collective falls apart after arguments about Brenda Ferguson’s “sore” leg. However, much restoration was achieved and the Flamingo was almost listed as a World Heritage Site. 2008 Gisborne-based model train enthusiast Troy Chaplin completes takeover. Secret plans to run miniature tracks around the walls cause falling-out with local tradesmen on the eve of the festival and Troy did a runner. 2009 Three former real estate executives had grand designs on the bar. 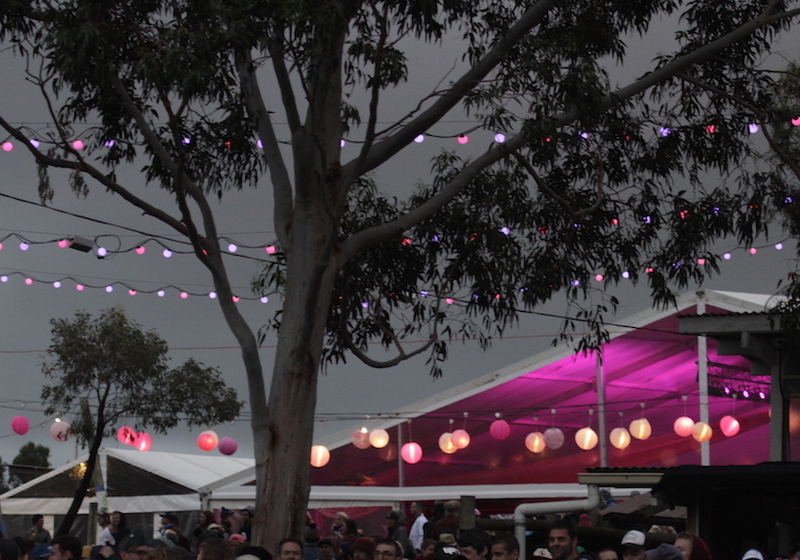 The masterplan was to start at Meredith to ‘create a buzz’, then hopefully the bar would ‘go viral’, then eventually franchise The Pink Flamingo right around the planet with the long-term goal of setting up a boutique casino version in Macau, replete with dancers (un)dressed as Flamingos and pink champagne fountains and holograms of The Rat Pack pretending to chat up patrons at the bar. 2010 was simply a terrific year in the Flamingo. Alby the Sparkie finally stopped mistakenly referring to it as “the Pelican” and under the expert charm and charisma of Double G the graceful old pink bird rested easy all weekend. 2011 The Flamingo underwent another facelift to remove several eras of bad renovation. Terry from Channel 9’s wardrobe department and Barry, a former Myer decor buyer, came up with a radical plan to rotate the marquee 180 degrees to give an airy feel with more natural light and a bigger, better view of the stage. The builders literally ripped away years of mistakes. The changes were very well received, but Terry and Aunty had several personality clashes which led to some unfortunate scenes on the Saturday night where Aunty was asked to settle her outstanding tab (unpaid since 2001) before Terry would serve her any more sherry, and then having her regular stool taken away whilst she was in the Ladies. Barry tried to play peacemaker but the damage was done – Aunty stormed off vowing to only drink at Eric’s from then on. 2012 saw yet another attempt at a fresh start – colourful former policeman and racing identity Danny Upshaw bought the freehold (“with my severance pay”) and vowed to “return the Flamingo to her heyday”, adding that an important piece of history had been lost with the previous year’s renovations and he hoped to attract back all the regulars from the 70s. Again, Aunty did not darken her doorstep. 2013 Danny Upshaw – against all odds – returned for a second year of operation. Slowly some of the old faces returned to the bar, coinciding with an influx of younger, well-heeled clientele. During landscaping works in the off-season, the original 1960s fountain was uncovered and was painstakingly-restored by local stonemasons to flow once again, with a grand opening on the Saturday Night of the festival. It wasn’t long before some wag from Staff Kitchen squirted in some Joy and turned the forecourt into a foaming cloud of slippery pink fun. Despite all the bonhomie, Aunty stayed away, preferring the company of the Peruvian backpackers at Eric’s. 2014 Danny Upshaw resisted offers from a wi-fi company to dress staff up as flamingoes and offer sly handset services in the backbar. The ‘pink’ fluoros in the backbar malfunctioned and gave off an ultra-violet hue, giving those in the small room the feel of being inside one of those glass sterilisation cabinets on a barbershop counter. Which was desirable, as it turned out. 2015 Citing Silver Jubilee celebrations and ‘the gaze of the nightclub world falling upon us’, not-so-subtle pressure from the Flamingo’s VIP ‘Standing On One Leg Club’ resulted in Upshaw making overtures to Aunty Meredith to return to the bar for the first time in several years (see ‘2011’). These included a formal written apology, published in the Meredith News, accepting full responsibility for the public spat, co-signed by SOOLC power-broker Brenda Ferguson and Upshaw, the defaced portrait of Aunty being restored by a professional forger of her choosing, and the grand old matriarch getting her stool back.